Welcome to 2017, officially. Our first guest of 2017 was Harry Doupe, but he counted as the last guest of 2016 since we rehashed the year in comedy. Then we had two weeks of highlights from our 2016 season. Tonight we get going with the new year, a month into it. Lori Gibbs was in town in December, in the middle of our white season. I bundled up and met her in her hotel room to chat away the cold. It was perfect because she's warm and funny. The Calgary-based comic (originally from Vancouver) is branching out from standup. She's now a keynote speaker, too. And a real craftsperson. Literally. We talk about all of the above. We also measure each other's giant noggins. Who's is bigger? You'll have to tune in to find out! We're on the air at 11 pm on CFRO 100.5 FM tonight. Lori and her posse can listen in from Calgary at coopradio.org or find us on the TuneIn Radio app. In fact, no matter where you are in the world, as long as you have wi-fi, you can tune in. And, of course, the show will drop as a podcast soon(ish). We had fun last week with all those clips of our past guests in 2016, right? Tonight we get to the rest of them: Steve Bays, Graeme Duffy, Jy Harris, Ed Hill, Chris James, Richard Lett, Brett Martin, Efthimios Nasiopoulos, Scott Patey, Nancy Robertson, Ari Shaffir, and Sam Tonning. More fun! Tune in at 11 and we'll get started. CFRO 100.5 FM in Vancouver or livestream us at coopradio.org or find us on your TuneIn Radio app. It's Harry Doupe time again! 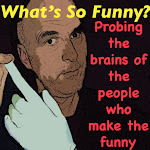 The veteran standup comic/producer/writer has recently moved back to Vancouver (or thereabouts) (again). We rehash the year that was in comedy. And, of course, go off on tangents, as we do. So you'll hear us gabbing about comedy "specials," comedy deaths, the Human Rights Tribunal, game shows, and Saturday Night Live. He also gives us a taste of a book he's been working on for years which he hopes will be published in 2017. Here you go. It's the first show of the new year. Have a listen. Also available at iTunes and Stitcher and elsewhere, if you can find it. It's not often you get Nancy Robertson in studio for an hour of free-wheeling conversation, so no matter how sick I was, I was going to be there. And I was sick. Usually the guest and I will sit in the same room but on this night I quarantined myself in the control room and had Nancy sit in the studio. But boy was I golden-throated! Best I've ever sounded; worst I've ever felt. After the show, I drove home and slept for 30 of the next 32 hours. Fun times! Robertson, as everyone knows full well, is best known for her role as Wanda on Corner Gas. We talked about that, how she started in acting (learning from one of the finest cowboy thespians in the business), and her formative years improvising with the Vancouver TheatreSports League. We also got into her love of obscure British TV series, her dislike of her new slow cooker, and her loss of respect for me for having not seen so many classic movies. We started off 2017 with a recap of 2016 with guest Harry Doupe. Tonight and next week we look back audibly on highlights from our shows last year. We can't get to them all because there are too many, but we'll do about half this week and we'll the rest next Sunday. You're going to hear snippets of conversations from the following guests tonight (not in this order): Dino Archie, Byron Bertram, Jason Bryden, Sophie Buddle, Sara Bynoe, Jeff Cooper, Grahaeme Cowie, Ivan Decker, Glen Foster, Jessica Holmes, Paul Hooper, Caitlin Howden, Shauna Johannesen, Sean Kent, Julie Kim, Simon King, Dave Merheje, Camille Mitchell, Tim Nutt, Rob Pue, and Mike Storck. Tune in tonight at 11 sharp to CFRO 100.5 FM. Or livestream us at coopradio.org or on the TuneIn Radio app. It'll be a fun show, promise. It's become a bit of an irregular tradition on the show to have Harry Doupe on the show at the end of the year to talk about the year in comedy. He's been with us in late December in 2009, 2011, 2013, and 2014. He's back tonight – really late December! Ah, first week in January is close enough. As anyone who's heard him on the show previously will know, Doupe was one of the first comics I ever saw live, back in the early 1980s at the now-defunct Punchlines Comedy Club in Gastown. Then he moved to Toronto (and elsewhere). He moved back to Vancouver a few years ago only to move away again. But I hear he's back to live again in the lower mainland, which is why I can welcome him back to the studio tonight. I saw him opening for his old buddy Norm Macdonald at the casino theatre in Coquitlam (I can never remember its name). We'll talk about the year that was and whatever else we can think of. We're on the air at 11 pm and will go until we're finished, at least midnight, on CFRO 100.5 FM. If you're elsewhere in the world (or don't own a radio), you can livestream us at coopradio.org. Getting back to business here after the holidays. Let's start with the posting of Sam Tonning's podcast episode. Sam is a guy I've probably seen more at jazz clubs than comedy clubs, but he's a very funny comic. And despite his good musical taste, he's also an unabashed and unironic lover of Phil Collins and Ted Nugent. Comedically, he's not ashamed to admit he adores Jay Leno and Dennis Miller, too. Got like a guy with the courage of his convictions. In this episode, we also discuss TV talk show sidekicks, moustaches, voice-over acting, playing the bass, and a whole lot more. Check it out below. Or go download it iTunes or Stitcher (or elsewhere) and take it on the road with you.